One question we often get is "How do you choose which families you serve?" and our answer is simple, "If they are facing a terminal diagnosis, we try to serve everyone." Our definition of terminal is this: a condition or disease that is incurable and will result in an early death. Sometimes people are unsure so they don't apply, but then there are people like Aisha, who wasn't sure if her mom would qualify, but applied anyway. In 2013, my mother was diagnosed with Frontotemporal Dementia, a rare form of dementia affecting approximately 10-20% of all dementia cases (according to the Association for Frontotemporal Degeneration). Dementia is a disease that steals the very essence of the person you once knew, slowly replacing them with a veritable shell of their former selves until it finally takes their lives. My mother has always been a strong, talented woman with a big heart and charitable soul. These characteristics remain as her memory and other aspects begin to fade away. My father and I would be so grateful if we could capture my mother's sweetness and my parents' love (they are high school sweethearts and have been married for nearly 42 years) one last time. Thank you, Ashley, for your consideration and all you do to help so many hurting families heal through the art of photography. Madison, one of our Love Not Lost photographers, joined me for this shoot. Now that we have multiple volunteer photographers, our local sessions will have two photographers for each shoot. With two LNL photographers, we're able to help each other out, whether it's moving equipment, rolling wheelchairs in and out of photos, making people laugh, or having an extra perspective - it makes a difference and we're so glad to be able to support each other. When Madison and I met Aisha and her parents, Ron and Rose, they were full of smiles and joy. We first stopped at a bench nestled in some ferns and pine trees, where Ron and Rose immediately cuddled up together. In fact, they were so in love, I didn't even need to give them direction on how to pose for photos. Their connection, which you'll see in the photos, was so evident, I asked them what their secret was. Being middle school sweethearts married 42 years has its challenges I am sure, but their answer was simple, "keep laughing... and choose to love every day." Ron, Rose, and Aisha were up for anything. Rose was in a wheelchair, but with Ron's help, she could stand for a few moments at a time for photos. We captured some beautiful family moments with all three of them, and then some special moments between Ron and Rose. When they were dating, Ron used to bring Rose her favorite cookies and chocolate milk to win her heart, so we were sure to capture an exchange of cookies during our session. We also looked through some old photos and shared memories as they reflected on their lives together. 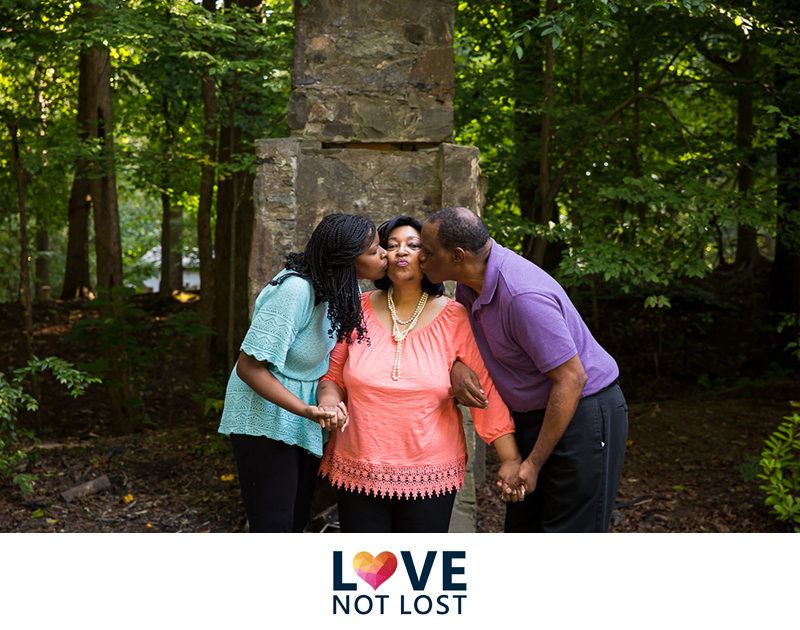 They are a strong, loving family and we had so much fun during our session! We hope you enjoy the memories we preserved for this incredible family. If you are interested in helping other families celebrate life and preserve memories, please consider becoming a monthly donor (even $5 per month makes a difference). 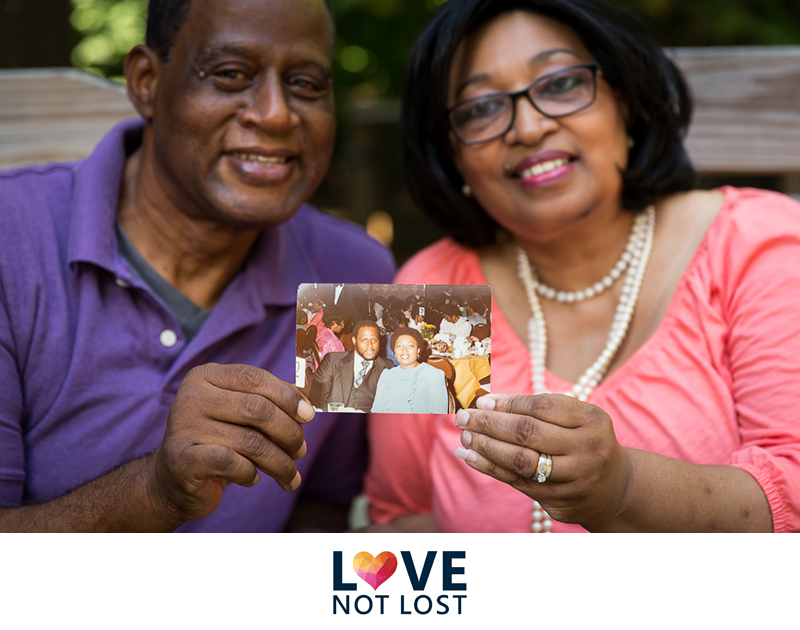 Your gift helps us continue to provide free portrait sessions and give each family a beautiful hand-crafted photo album to carry on their legacy. Thank you!